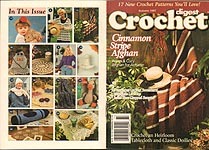 Crochet Digest another one of those wonderful little digest- size magazines, published by House of White Birches. 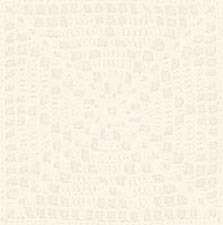 Each issue was packed with outstanding patterns. 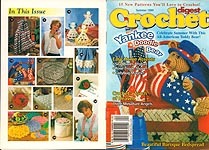 As of the Summer 2000 issue, the magazine was updated and relaunched as Fast & Fun Crochet. 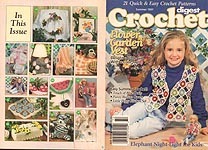 Crochet Digest, Summer 1995. Projects include: Desert Diamonds Afghan, Long Lacy Vest, Rain Clouds Vest, Child's Polka Dot Dress Set, Americana Pillow, Fashion Doll All- American Outfit, Delicate Bridal Florals (Wreath, Comb, Garter), Sunbonnet Sue Afghan, Pineapples & Petals Doily, Summer Roses, Strawberry Delight basket & berries, Blueberry Kitchen Set (Pot Holder, Dishcloth, Oven MItt, Dish Detergent Apron). 'Good" written on one page -- otherwise, very good used condition. Crochet Digest, Spring 1997. Projects include: Country Hearts Afghan, A Lady's Beret, Ribbons & Roses Hat, Cuddle- Up Teddy Bear, Toddler's Little Lamb Sweater & Blanket, Floral Panel Tablecloth, Bible Cover & Bookmark, Tulip Time Valance, Roses & Lace Photo Frame, Springtime Jewels Afghan. Very good condition. 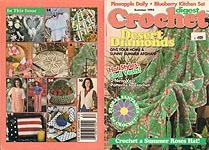 Crochet Digest, Summer 1997. Projects include: Peaches & Cream Throw, Touch of Blue Doily, Elephant Night Light, Gingham Table Set (Place Mat, Pot Holder, Coaster), "This Little Piggy" Kitchen Set (Pot Holder, Towel Topper), Basket of Sunflowers Tissue Box Cover, Fashion Doll Vest & Hanger, Pansy Promise Place Mat, Coaster, Napkin Ring, Wreath), Child's Flower Garden Vest, Cuddle- Me Bear, Baby's Dainty Pinafore & Hat, Pansy Button Covers, Cutwork Glass Bowl, Summer Bouquet Picture, Watermelon Magnet. Very good condition. 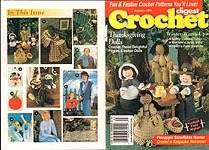 Crochet Digest, Autumn 1997. Projects include: Pineapple Lace Top, Jewel Tone Cropped Sweater, Autumn Rose Hat, Cinnamon Stripe Afghan, Hexagon Ripple Afghan, Itsy Bitsy Ghost, Happy Haunting! ghost, Hairpin Lace Doily, Heirloom Tablecloth, The Ugly Duckling, French Vanilla Winter Set (hat & scarf), Antique Scalloped Doily, Floral Barrettes, Giantic Crayon Pillow. Very good condition. 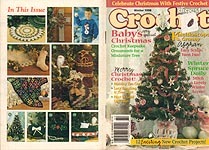 Crochet Digest, Winter 1998. Projects include: Lacy Christmas Tree Set - Skirt & Stocking, Hint of Gold Gift Bags, Wonter Spruce Doily, Edelweiss Tissue Topper, Floral Cross, Baby's First Christmas miniature ornaments to fit 18" tall tree (Tree Skirt, Angel, Hairpin Lace Garland, Star, Candy Cane, Roll Stitch Ornament), Child's Snowman Pullover, Kaleidoscope Granny Afghan, Red Rose Purse, Holiday Tea Cozy. Good condition -- overall wear. Crochet Digest, Summer 1999. 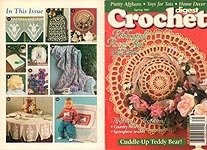 Projects include: Sea Waves Afghan, Diamond Lace Vest, Ring Around A Posy, Yankee Doodle Bear, Celestial Trio, Ladybug on a Leaf, Summer Flair Table Set (Place Mat, Coaster, Basket), Ecru Bouquet Doily, Rose Bathroom Tissue Topper, Baroque Bedspread, Forever Yours Chatelaine, Wisteria Edging, Poinsettia Sachet. Very good used condition. 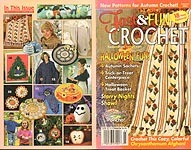 Crochet Digest, Autumn 1999. Projects include: Country Roses Afghan, Softly Cabled Tunic, Thansgiving Dolls (Pilgrim Girl & Boy, Indian Girl & Boy), Football Afghan, Hat & Scarf for Him, Pineapples & Snowflakes Runner, Mini Pumpkin Wreath, Pumpkin Pin, Autumn Aran Vest, Child's Folk Floral Sweater, Toddler Toezies, Pretty Pouches. Very good used condition. 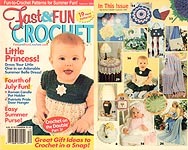 Fast & Fun Crochet, Summer 2000. Projects include: One- Day Doilies, Dragonflies & Daffodils Afghan, Strawberry Broom, Cotton Floral Rug, Mary's Little Lamb, Pretty Pastels Bath Set (Washcloth, Soap Holder), Victorian Thread Holder, Bob & Rattle Combos (Little All-Star, Little Miss Liberty), Grand Old Flag Place Mat, Miss Mousie, Summer Purses, Cottage Garden Afghan, Sparkling Stars Ornaments. Very good used condition. 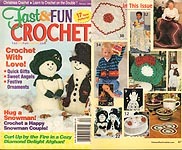 Fast & Fun Crochet, Winter 2000. Projects include: Diamond Delight Afghan, Little Angel Friends (5 different designs), Ornament Earrings, Holiday Christmas Wreath Hot Pad, Snowman Wind Sock, Christmas Bell Ornament, Snow Couple, Pineapple Star Doily, Precious Pastels Baby Blanket, Keep on Truckin' child's sweater, Touch of Gold Potpourri Set (Bowls and Coasters). Very good used condition. 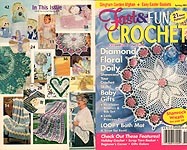 Fast & Fun Crochet, Spring 2001. Projects include: Gingham Garden Afghan, Baby's Little Princess Dress, Lighted Floral Topiary, Diamond Floral Doily, Floral Fantasy Doily, Shamrock Wreath, Butterfly Accents, Easy Easter Baskets, Golden Easter Eggs, Crochet On the Double Lesson 2 -- Three- Piece Table Set, Diagonal Lace Shawl, Riged Ripple Afghan, Loopy Bath Mat, Heirloom Bib & Booties, Little Cherubs. Excellent condition. 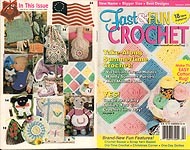 Fast & Fun Crochet, Summer 2001. Projects include: Ribbons & Shells Afghan, Tiny Broom Angel, Ruffled Emerald Doily, Country Door Pillow, Roman Candle Pot Holder, Pretty in Pink Baby Set, Humingbird & Lilies Centerpiece, Crochet & Ribbon Purse, Patriotic Pride Door Hanger, Classic Elegance Doily, Fast & Fun Pot Holders, Baby's Summer Belle Dress, Pretty Pineapple Lamp Shade, Dreamy Pastels Table Set, Crochet on the Double Lesson 3 -- Summer Skies Afghan. Excellent condition. 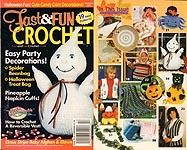 Fast & Fun Crochet, Autumn 2001. Projects include: Circus Stripe Afghan & Clown, Cozy Floor Runner, Easy Beginner Doily, School Days Vest, Friendly Ghost, Southwest Kid's Sweater, Spider Beanbag, Jack O' Lantern Purse, Crochet On the Double Lesson 4 -- Reversible Vest, Lame Bracelet & Barrette Set, Hanging Candy Corn & Beanbag, Cat in a Pumpkin, Beaded Pineapple Napkin Cuff, Snuggly Baby Caps, Geometric Square Afghan. Excellent condition. 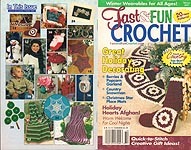 Fast & Fun Crochet, Winter 2001. Projects include: Country Snowman, How Many Baking Days Left kitchen helper, Touch- of- Country Tree Skirt & Stocking, Keepsake Ornament, Christmas Star Place Mats, Rose Garden Dreams Afghan, Floral Fantasy Greeting Card, Teacup Pincushion, Puffy Drawstring Purse, Yo Yo Christmas Tree, Berries & Popcorn Garland, Santa Stocking, Winter Scarf Set, Suncatcher Snowrlake, Carnation Crochet Hoop Protector. Excellent condition. 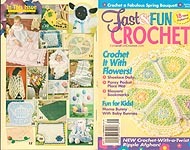 Fast & Fun Crochet, Spring 2002. Projects include: Twist Stitch Ripple Afghan, Newborn Baby Bunting, Pansy Place Mat, Kite Sewing Kit, Shoelace Doily, Brickwork Diamonds Shawl, Reversible Floor Runner, Spring Bouquet, Egg Salad, Black- Faced Lamb, Pineapple Pillow Topper, Rose Sachet Envelope, Hearts Delight Baby Afghan, Blossoms & Rose Petals Bookmarks, Blue Bow Tea Cozy, Mama Bunny & Her Babies. Excellent condition. 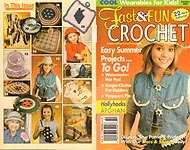 Fast & Fun Crochet, Summer 2002. Projects include: Hollyhocks Afghan, Watermelon Hot Pad, Perpetual Motion Doily, Child's Heart's Fancy Hat & Sweater Set, Broom Doll Magnet, Denim Vest Trim, Teatime Hostess Gift, Potpourri Pie, Colorful SUmmer Afghan, Stars & Stripes Doily, Grape Cluster Pot Holders, Golf & Tennis Sports Towels, Special Occasion Clothespin Dolls (Graduate, Bride, Watermelon Angel), Sassy String Hat, Groovy Purse & Headbands. Excellent condition. Fast & Fun Crochet, Autumn 2002. Projects include: Mosaic Shells Baby Afghan, Rainbow Caterpillar, Sliced Apple Pin, Chenille Cell Phone Case, School Days Sweaters, Trick Or Treat Centerpiece, Reversible Hooded Poncho, Double- Duty Pot Scrubbers, Pineapple Daisy Doily, Daydreams Doily, Autumn Chrysanthemum Afghan Halloween Treat Basket, Autumn Sachets, Starry Nights Stole, Tweed Winter Set, Christmas Tree Frame, Christmas Ornament Collection. Excellent condition. 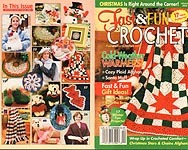 Fast & Fun Crochet, Winter 2002. Projects include: Christmas Stars & Chains Afghan, Christmas Plaid, Sassy Snowman, Gold Trimmed Snowflake, Plucky Penguin, Teddy Bear Ornaments, Christmas Boots, Santa Muff, Winter Wonderland Scarf Set, Cozy Crocheted Wrapy, Miss Petite Fraimed Doily, Christmas Rose Doily, Schalloped Pineapple Doily, My Lady's Washcloth & Soap Bounty, Hearts Bookmark, Rainbow Doll Dresses (6-3/4" "Cindy" doll), Ballerina Bear. Excellent condition.